Huawei today unveiled two new smartphones at an event in London, the P9 and P9 Plus. Huawei developed the P9 and P9 Plus with help from Leica in order to improve camera performance. The phones feature two, 12-megapixel side-by-side cameras on the rear and a single 8-megapixel camera on the front. The two-lens setup on back includes one full-color sensor and one monochrome sensor that work in concert. Huawei says the monochrome sensor is used to assess and capture light for more accurate exposures. Huawei redesigned its camera app with Leica's help. The devices have 5.2- and 5.5-inch full HD screens, respectively, with side bezels measuring 1.7mm thick. 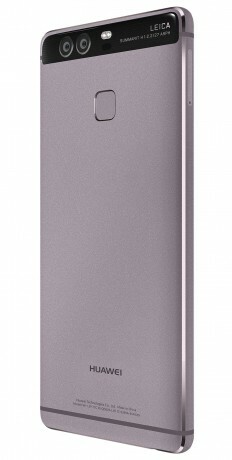 The P9 uses an IPS LCD panel, while the P9 Plus relies on a Super AMOLED screen. Both phones are slim and boast metal and glass designs. The P9 and P9 Plus are powered by Huawei's Kirin 955 octa-core processor, with four ARM A72 cores and four ARM A53 cores. The phones come with either 3 GB or 4 GB of RAM. The phones support memory cards and include fingerprint sensors on the rear for biometric security. Other features include stereo speakers, infrared, USB-C, and 3,000/3,400mAh batteries. They run Android 6.0 Marshmallow with Huawei's EMUI 4.1 skin. Pricing for the P9 starts around $680 and the P9 Plus starts at $850. Huawei didn't say if or when either phone will be made available in the U.S. The company sells many of its phones directly to consumers online.